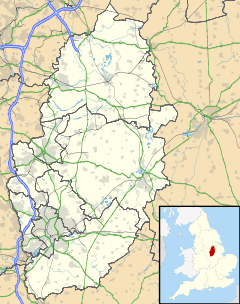 Newstead is a small village and civil parish in Nottinghamshire, England. It is situated between the city of Nottingham and the town of Mansfield in the borough of Gedling. It is a former coal mining village, and was previously called Newstead Colliery Village. Lord Byron, the poet, lived at nearby Newstead Abbey. The parish is part of Nottinghamshire's Hidden Valleys. It has a population of 1,194, increasing to 1,312 at the 2011 census. Newstead Primary School is a state run primary school for children aged 5 to 11. Newstead railway station is on the Robin Hood Line, which runs from Nottingham to Worksop. The colliery village was built at Newstead in the late-19th century for miners at Newstead and Annesley Collieries. Newstead Colliery operated between 1874 and 1987. The former mining location has now been redeveloped into a nature reserve and business park. Hazelford Way Industrial Estate is home to several large companies including Bunches Florapost; Badgemaster; and Leivers and Millership. ^ "Parish Headcounts: Gedling". Neighbourhood Statistics. Office for National Statistics. Retrieved 9 September 2011. ^ "Civil Parish population 2011". Neighbourhood Statistics. Office for National Statistics. Retrieved 12 April 2016.